I’m definitely a big fan of the auto-capture option – it will really speed up the process when we’re digitizing larger volumes. Crowley’s self-manufactured overhead document and book scanner (ODS) has been designed to create an affordable, high-quality patron scanner for users of any experience level. The ODS scans documents, bound books, spiral notebooks, lab books, binders, photographs and other flat or bound media up to A2 size with a high definition calibrated sensor. 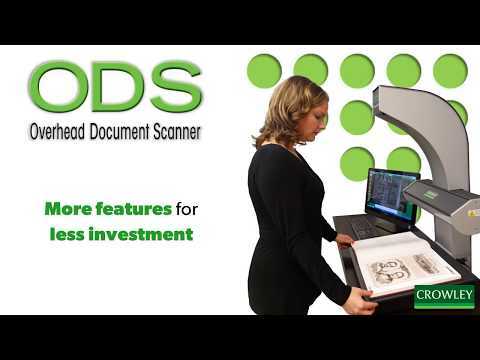 Through user-friendly software and a familiar touchscreen interface, the ODS Scanner is ideal for public and corporate use in libraries, universities, businesses, government sectors and more. The modern design and wide-angle LED light system ensures fast scan times with an output resolution of up to 2400 dpi in color, grayscale or black and white. More image quality. More portability. Less cost. View more document scanner product options here.